What do you do when you are lining your life up to the Word of God, purposefully choosing to do His will, and life still seems to be not working right? We all have been there. We’ve made our decisions to get sin out of our lives, to ‘do it God’s way’, thinking it will bring us victory and success; yet, nothing changes – or worse, it gets more unpleasant. You’ve made a decision to tithe based on the Word – Malachi 3:8-12, Matthew 23:23 and Luke 11:42. You’ve heard the testimonies from so many who said, “The moment we decided to tithe, blessings came pouring in!” The Word promises that you will be blessed if you tithe and you believe it. Yet, you tithe and the refrigerator, the washing machine, and the car all break down the same week! The money you tithed would have covered all the repairs. After hearing so much about what must be done in the natural to restore good health, and based on the Word – 1 Corinthians 6:19, 1 Corinthians 9:27, Jeremiah 33:6 and 1 John 2, you chose to drastically make better choices in your diet and lifestyle. You felt confident that, once you began honoring the temple of the Lord, you would feel terrific and be full of energy. Instead, you don’t feel that same bountiful level of health others say they obtained when they did the same thing. You feel blah and are left wondering if all the sacrifice of the foods you love and the pain of exercise are worth it. So, what do you do? You have a few choices, actually. You can give up and throw in the towel saying, “Why did I even bother? I should’ve known God would not come through for me.” Or, you can go numb because it hurts too much to keep trying to do the right thing and never get the prize. You could even choose to determine that this Christianity stuff really IS a hoax, created for those who don’t have a brain! The only real choice you have is to keep on keepin’ on! One of my favorite preachers talks about what to do between the “Amen” and the “There-It-Is”. He says, “Having done all you can to stand, stand some more!” Ephesians 6:13. In other words, don’t give up! At the same time, you cannot get into murmuring and complaining, moaning and groaning about it. Yes, there is a time to be honest with the Lord. Tell Him you are in a quandary. Tell Him you don’t understand why His Word says one thing but another is happening. You can share your struggle with a like-minded close friend or mentor, but don’t share it with the world. Afterward, you must choose to buck up, and endure like a good soldier. We must make a choice to base our lives on the Word, not on the circumstances our senses can see, hear and feel. Another one of my wonderful teachers always says, “The power is in consistency”. We didn’t get where we are at overnight; God rarely gets us out of where we are overnight. As it was with the Israelites when they finally entered the promised land, it is with us: “Little by little I will drive them out before you….” Exodus 23:30 Slow and steady wins the race! Consistency has power. Don’t give up! Hang on tight! 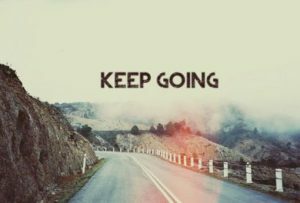 Keep on keepin’ on! We have come to a microwave mindset. Pray, wait 45-seconds and expect results. It may work for popcorn and leftovers, but typically not in matters concerning our prayer requests and intercession. Just because I have learned to expect microwave-like results does not mean God is bond by my expectations. Sometimes the process is part of God’s response. Though God may desire to grant our requests even more than we desire to receive from Him, like a good Father he knows not only what is best, but also when is the best time for us to receive what is best. When my daughter was just learning to ride a bicycle she wanted a ten-speed bike. As her dad, I wanted to give her a ten-speed bike. However, knowing her abilities and skills level, I got her a small, one-sped two-wheeler with training wheels only because I, as her dad, knew what was best for her at the time. There is always an interval between planting and harvesting. That may not be my way, but it seems always to be God’s way. Thank you for your wisdom, Carl…. keep the faith!